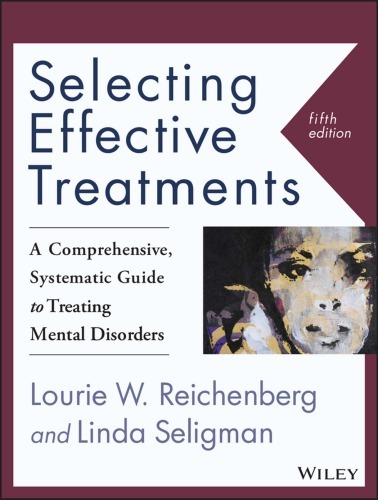 Lourie W. Reichenberg, Linda Seligman, "Selecting Effective Treatments: A Comprehensive, Systematic Guide to Treating Mental Disorders, 5th Edition"
Selecting Effective Treatmentsprovides a comprehensive resource for clinicians seeking to understand the symptoms and dynamics of mental disorders, in order to provide a range of treatment options based on empirically effective approaches. This new fifth edition has been updated to align with the latest changes to the DSM-5, and covers the latest research to help you draw upon your own therapeutic preferences while constructing an evidence-based treatment plan. Organized for quick navigation, each disorder is detailed following the same format that covers a description, characteristics, assessment tools, effective treatment options, and prognosis, including the type of therapy that is likely to be most successful treating each specific disorder. Updated case studies, treatments, and references clarify the latest DSM-5 diagnostic criteria, and the concise, jargon-free style makes this resource valuable to practitioners, students, and lay people alike. Planning treatment can be the most complicated part of a clinician's job. Mental disorders can be complex, and keeping up with the latest findings and treatment options can itself be a full time job.